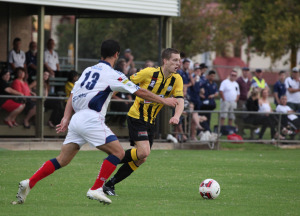 West Torrens Birkalla made an emphatic statement as they claimed a 4-1 victory over South Adelaide Panthers at Jack Smith Park in the opening round of the South Australian PlayStation4 National Premier League. Birkalla’s Jordan Watson enjoyed a perfect start to the season by claiming a hat trick, Daniel Waine showed plenty to come off the bench to score his team’s fourth while South Adelaide’s Matthew Muscroft claimed his side’s only goal. Under a picture perfect sunset, Watson had a near perfect game. His first of the night came just before half time after some impressive work down the left flank by Sam Shoemark left him open to ease the ball past South Adelaide keeper Marijan Kolar. As South Adelaide looked to press, the home side were forced into some neat passing and they answered brilliantly as Watson scored his second. After some clinical timing and a sublime work down the left flank again by Shoemark, Watson was left one-on-one with the keeper and he didn’t disappoint. His third had a touch of flair as he showed brilliant footwork to get the ball well inside the box, manoeuvre his way around the keeper to hit in the back of an open net. South Adelaide’s Matthew Canny saw red after a last line of defence challenge went wrong. With a firm grip on the game, Watson was replaced by Daniel Waine who capped off a great night for the home side. Once again, some intuitive ball movement left Waine alone just inside the box, his white-hot first touch set him up to slot the ball into the back of the net. South Adelaide’s English recruit Matthew Muscroft picked up a goal around the 80th minute with a sweet first time hit form the edge of the box but it proved to be a mere consolation goal. It was no surprise West Torrens Birkalla Captain Julian Torresan was happy with the result and even more delighted with the performance from his team. While Jordan Watson impressed up front with his all round game, Torresan said there were plenty of positives besides Watson’s hat trick. For South Adelaide Senior Coach Danny Graystone, Sunday night was a night to forget but one with an important lesson. Graystone was upbeat about his side and gave a reminder about what’s required to turn things around.